Out of habit, I looked over my shoulder once every few moments to make sure I wasn’t in danger of being flattened by a vehicle flying around the blind curve behind me, but deep down I knew better — on that evening, the western border of Arizona belonged only to us. I crouched low, nearly touching my chest to the pavement, lifted my phone, and took a picture of the last rays of sunlight before they disappeared on the west side of the mountains ahead. I had never been a ‘sunset person’, certainly not the kind who ever felt compelled to stop and photograph one. But there I was, in the middle of a highway, doing just that. My dad waited patiently in our rented Nissan on the side of the road. The sun sank lower and the car’s shadow lengthened before vanishing completely. I sat back down in the driver’s seat as darkness and a warm May breeze blanketed the desert, anxious to get to our next scheduled rest stop, somewhere near Barstow. Over the previous four days we had covered a few thousand kilometres and were about to cross into our eighth state. I put the car in drive and we continued on into the night. The inspiration for this trip came when my wife was four months pregnant with our first child. Parenthood had been a long time coming for us, but excited as I was, I questioned my dad-worthiness. In my worst moments, I can be insufferable; in my best moments, I’m prone to solitude and moodiness. As my wife’s belly grew along with the pile of little pink baby things in our Chicago apartment, so did my anxiety. With new responsibilities looming, I felt a deep and admittedly selfish desire to be spontaneous and carefree. So I decided to do something I had always dreamt of doing: following the original Route 66 connecting Chicago and Santa Monica from start to finish. There was also a slightly more noble reason for me wanting to go — the open road has always held a mystical power over me. Like a soothsayer, I believed that it would coax clarity from my troubled mind as I contemplated fatherhood. On that same train of thought, I decided to invite my dad along for the ride so I could shake a few kernels of fatherly wisdom from the man who had managed to raise three boys who all still loved him. We began the first day of our journey at 66’s ceremonial starting point, Lou Mitchell’s restaurant on Jackson Boulevard in Chicago, with breakfast in the shadow of the Willis Tower and finished it with chicken fried steaks at a log cabin barbecue joint called the Missouri Hick. Between the two, we encountered a treasure trove of Americana. 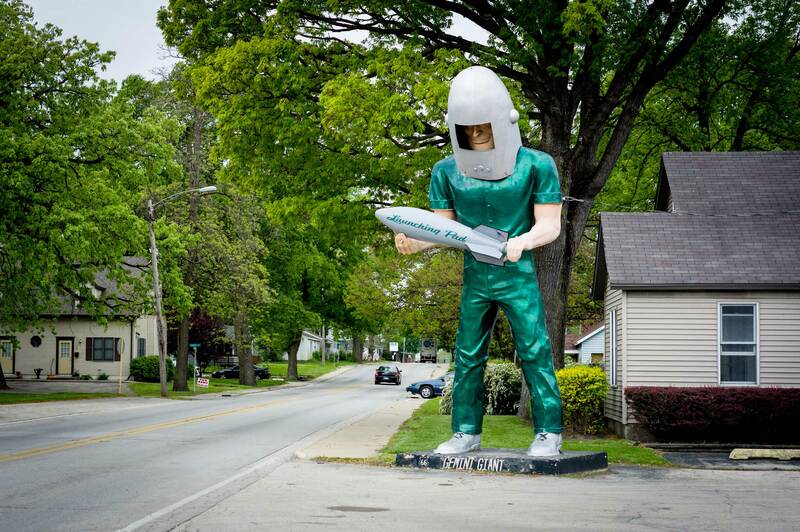 Route 66’s first notable landmark outside of Chicago was a twenty-foot-tall spaceman statue in the deserted parking lot of the former Launching Pad Café in Wilmington, Illinois. The route boasts many such ‘giants’, fossils from an era when fibreglass behemoths advertised everything from hamburger huts to muffler shops. When I had seen the crowd of fellow trekkers at Lou Mitchell’s earlier that day, I had wrongly assumed each stop in our guidebook would be packed with people. Fortunately, this was not the case; at the spaceman, as with most of the drive, my dad and I were completely alone. 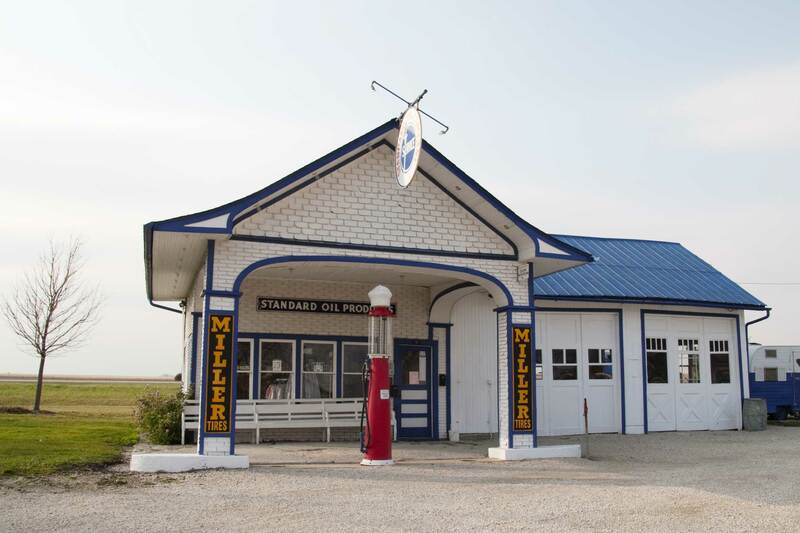 In Odell, Illinois, we pulled off the highway and toured a well-preserved 1930s-era service station, complete with the original red, glass-topped gas pump. Just outside of Pontiac, Illinois, we walked along portions of the original road slab that were inaccessible by car. At the Cozy Dog drive-in in Springfield, I ate the only good corn dog I’d ever had. We flew through Missouri and a sliver of Kansas to begin the second day, trying to stick to as much of the original route as possible, driving in a serpentine pattern much of the time to avoid the conveniences of the interstate highway system. That meant that the navigator couldn’t take his eyes off the directions in our guidebook for more than a few miles at a time without missing a crucial turn, which, in spite of our best efforts, we managed to do, ending up on some of the most extraordinarily lonely backroads that I had ever seen. 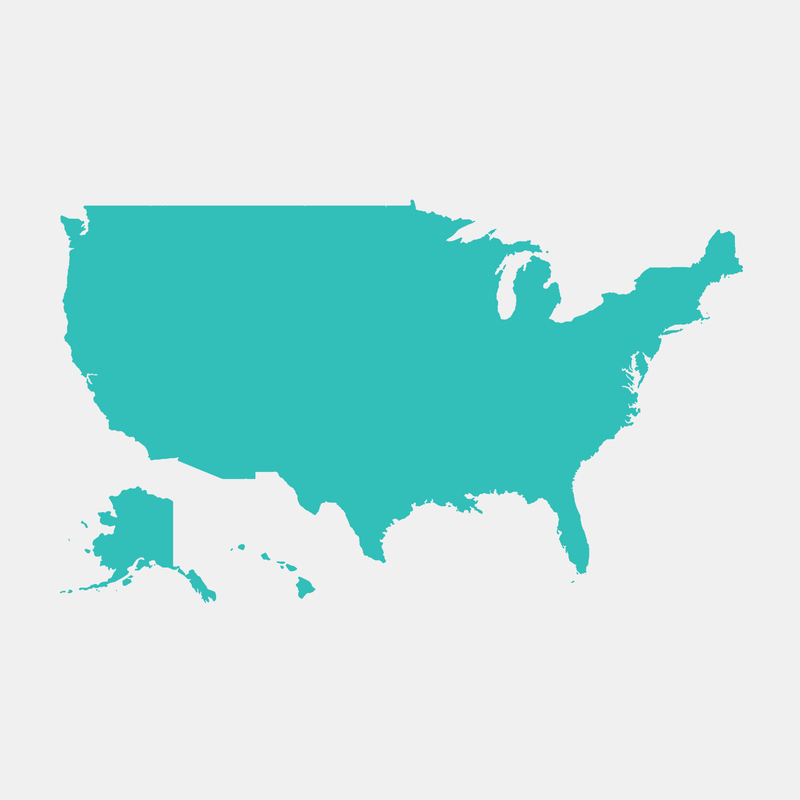 As the distance between us and home grew, I thought about how to tell Dad that I was terrified of becoming a father and ask for his help, but the conversation always sounded like a made-for-TV movie in my head. Real fathers and sons don’t talk like that, so it didn’t come naturally. Instead, I sat quietly and watched the towns pass. That afternoon, we took a detour into Commerce, Oklahoma and stopped at the childhood home of baseball legend Mickey Mantle. It was a simple white wood frame house on a bare lot, but to us it was a holy site. Dad called me over to a rusty tin barn adjacent to the home and pointed to its side, pock-marked with baseball-sized dents; the barn had been the Mick’s backstop, where his father and grandfather pitched batting practice to him in the evenings after dragging their bones home from the nearby zinc mines, before each of them dropped into an early grave. I lingered around the invisible home plate next to the man who had taught me how to hit a baseball and listened to the ghosts rustle the tall grass. I saw him think for a moment and look down, choosing his words carefully. “I didn’t know what I was doing when you came along, but we figured it out,” he said sincerely. “There aren’t any secrets, but if I could do it, so can you.” It was a nice sentiment, but I knew better. There was more to it than that, but I realized that my dad probably wasn’t any better at answering the question than I was at asking it. We got an early start leaving West Texas the next morning and drove straight through New Mexico. It was the part of the drive that I had most looked forward to. As a boy, I’d logged those kilometres with Dad many times before from our home in Corsicana, Texas, to the Sangre de Cristo Mountains, cruising along in his cramped Ford pick-up with Willie Nelson and James Taylor in the background. There, he taught me to fish for trout in the same cold streams around Tres Ritos, New Mexico, where his father had taught him. There had been something intoxicating about that stretch when I was a boy, the way that the table-top landscape converged with sky in every direction. It was, and is, a desolate, depressing corner of the world, but for some reason I have always loved it. Years had passed since we last travelled that way but the happy anticipation I had felt as a child came rushing back to me. 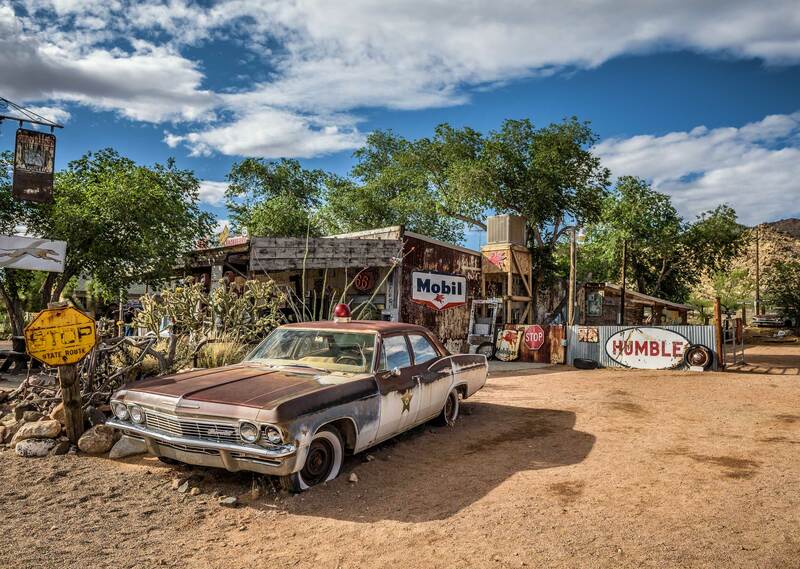 The road took us through an unending succession of decrepit desert towns whose lifeblood had been siphoned off slowly by the interstate until their hearts dried out and blew away in the wind. 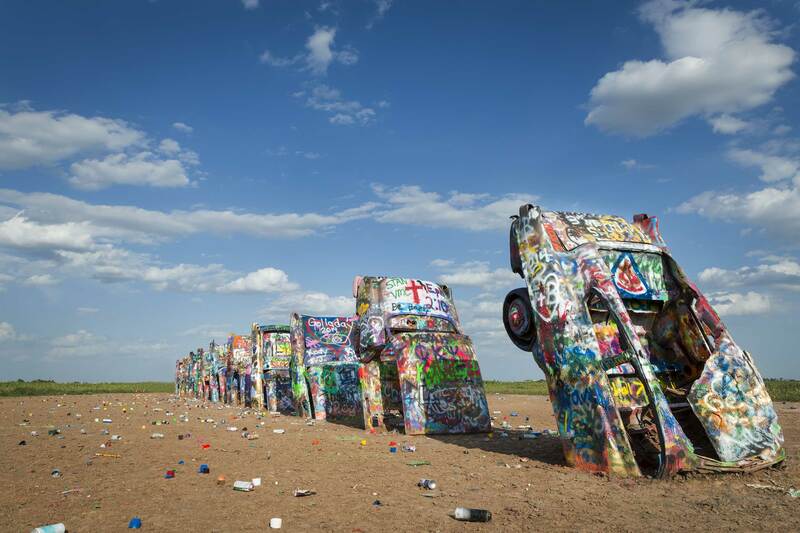 All of them were filled with the same neon-crowned roadhouses and crumbling motels. A nice couple took our picture standing on the corner in Winslow, Arizona, while we paid our respects to The Eagles’ Take It Easy. 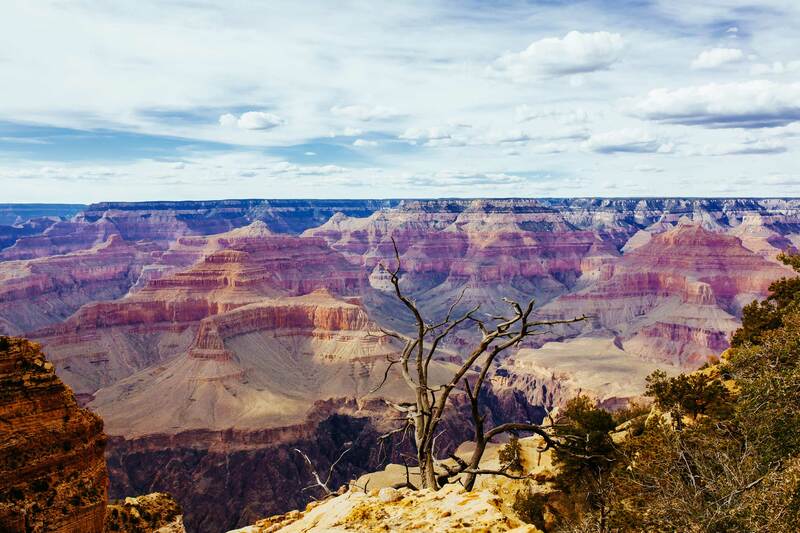 We dodged tourists and peered over the south rim of the Grand Canyon and ate our weight in patty melts and French fries at a place called Miz Zips in Flagstaff. But all the while I kept waiting for a bigger revelation. I wanted comfort — the comfort of knowing I had finally taken that long dreamt-of trip, that I had lived my life, had done and seen it all — before I returned home ready to plant myself firmly into familial bliss with no regrets. Most of all I wanted the comfort of knowing that I could raise a child who would grow to love me like I loved my own dad. What had he done right, and how could I make sure that I did it for my daughter, too? On the fifth and final day we departed Barstow early in the morning. 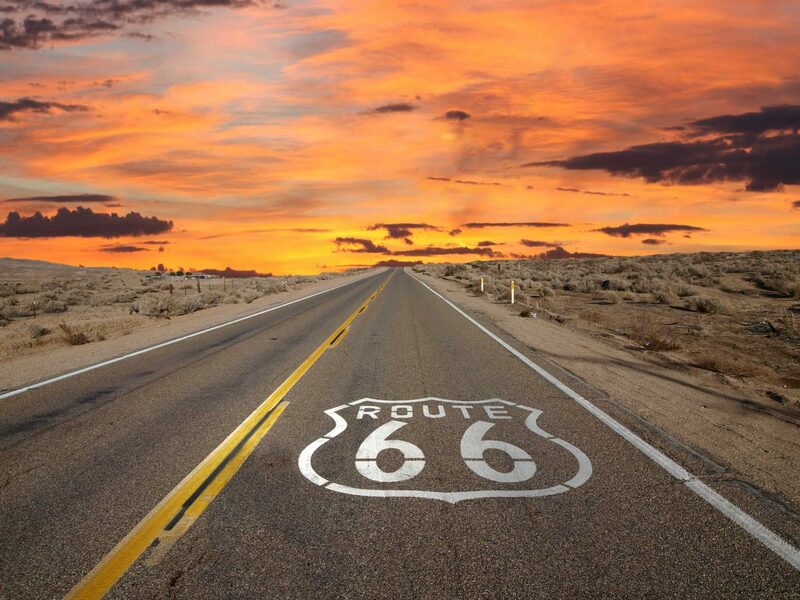 From the Mojave Desert in the morning to the Pacific Ocean in the afternoon, Route 66 saved the best for last — not counting the length of suburban sprawl between San Bernardino and Pasadena. How I wished at that moment we hadn’t sworn off driving the interstates. We hit West Hollywood just as early afternoon rush hour began, and crawled through Beverly Hills into Santa Monica. My back ached from spending days in the cramped sedan and my patience was thin, even in the presence of my dad’s Buddha-like calm. I white-knuckled the steering wheel and swore at other drivers under my breath while he quietly looked out the window. Finally, mercifully, we turned onto Colorado Avenue for the final push to the Santa Monica Pier. 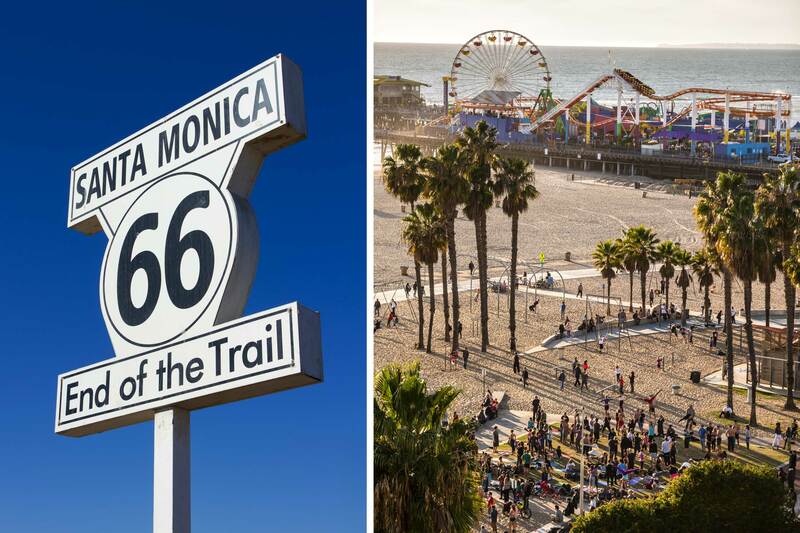 We parked the car and stumbled through the crowd of gawkers on the pier until we saw it: a tall white sign emblazoned, ‘Santa Monica 66, End of the Trail’. We huddled together underneath it and I snapped our photo while others waited for their turn. But I didn’t want to move out of the way; I had thought about that spot on the boardwalk for nearly 4000 kilometres. We had earned that moment under the sign, yet it felt anticlimactic. The drive had been fun, but I had hoped for more — a vision quest of sorts — and I had failed. We walked down from the pier onto the beach and looked out at the ocean. By that time it was nearing five o’clock in the afternoon; my mom was due to land at LAX at six. She and my dad were going to spend the rest of the week together in Los Angeles while I headed back east to meet my wife in Palm Springs before flying back home. “We should probably get going,” I said. There’s always time. I thought about that as we ordered our food and sat down at a picnic table to eat. Dad had always made time for my brothers and me when we were young, which is why we made time for him once we got old. It wasn’t the sage-like advice or magic bullet of parenting I had hoped to discover, but it was a good start.